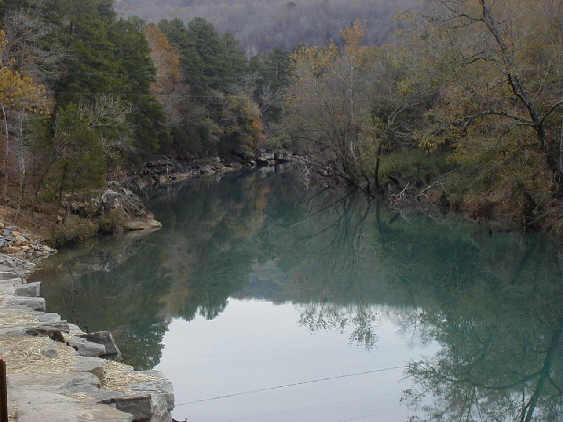 Floaters who have been down the Mulberry River tend to describe it as 50 miles of whitewater. That's not completely accurate, but the Mulberry pours over ledges, shoots through willow tangles, and whips around sharp turns. When you've floated it, you won't wonder why they named one of those turns "Whoop and Holler". You'll wonder why they didn't tack the name onto all of them. 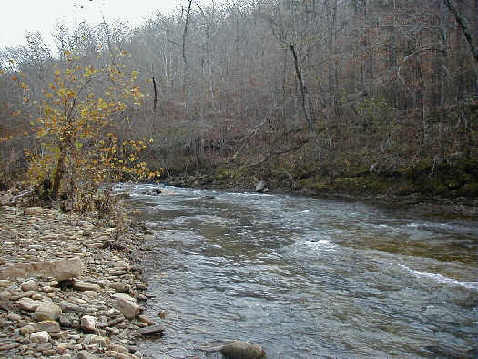 This Ozark river has earned its wild reputation and deserves the class II/III rating it holds in the spring. In drier times, it's a good place to swim, fish for smallmouth, or float on an air mattress. It's a river for all seasons, as the Arkansas General Assembly recognized when it officially declared the Mulberry a scenic river in 1985. 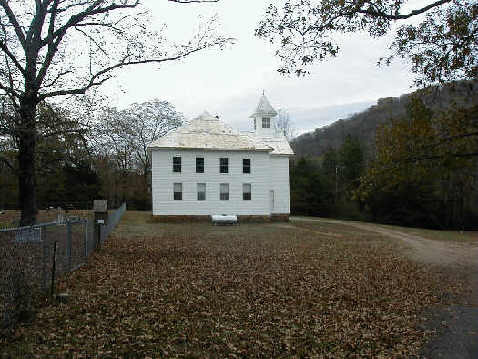 The Mulberry begins high in the Ozark Mountains and flows in a west-southwesterly course down towards the Arkansas River. It's in a rush to leave the Ozarks. Short by Arkansas standards, a total of just 70 miles, it tumbles downhill at breakneck pace and is floatable after wet weather from about Oark to I-40. 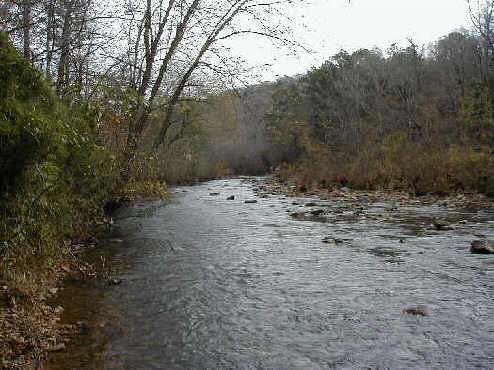 The average drop over the length of the river is about 12 feet per mile. Because of its ruggedness, floaters are urged to have at least one other support canoe with them and always to use a life jacket. 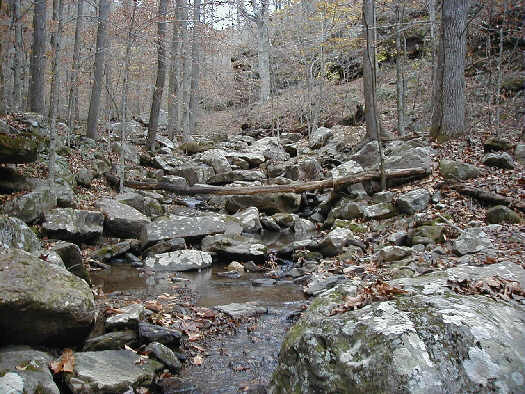 It's narrow canyons, tree-lined bluffs, and dense woods are typical Ozark Mountain scenes and its isolation makes it a superb stream for wildlife sightings and bird watching. This area hosts the state's largest concentration of black bears, a shy animal not often seen, but you could round a bend to catch a glimpse of one heading for cover. The fishing in early spring may be hampered by the fast water, but later anglers take smallmouth, largemouth, spotted bass and green and longear sunfish. The potholes can be fished productively even during drier months, but you may have to do some hiking to reach them. Access to the river is particularly good on the upper stretches where it flows through National Forest. The Forest Service operates two campgrounds on the river, Redding and Wolf Pen, and three others nearby, Shores Lake, Ozone and White Rock Mountain. Commercial float outfitters are available and some also have camping facilities. There's an infinite variety of fast water, slow water, roaring rapids, choppy chutes and twisting channels on this challenging and changing river. From the top float access near Oark to its mouth you can expect sudden plunges into holes, haystacks, and hazards from trees fallen during spring floods. You may want to carry along an axe for help in clearing the river. Picturesque names like Rocking Horse Rapids and Picture Book tell the Mulberry's story and these should be readily negotiable by experienced canoeists, but the ones that have earned the sobriquets like Little SOB may be another story. Rock strewn and challenging, it's a built-in slalom course squeezed between huge boulders that takes some expertise. Near Milton Ford, you'll catch one known as The Strainer for the number of people that have been strained right out of their canoes in this tangle of willows where the water spreads out on a right hand turn and runs under dropping willow branches. Some of these rapids deserve enough respect to pull up and scout before trying them and you may choose to walk around some. 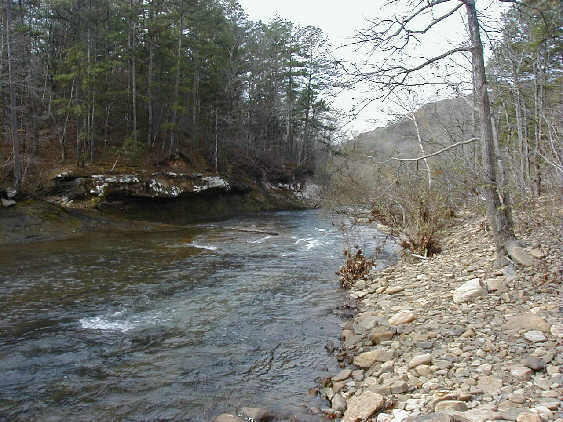 One of the most scenic spots on the Mulberry is Rotten Rock, which lies just below Hell Roaring Falls. The Falls themselves are the most photographed spot on the river, mainly because they offer such an excellent big shelf of rock where you can stop and get a good view. Rotten Rock looks just like a huge dental cavity and you can paddle close to examine this deteriorating bluff in the otherwise sound sandstone. Even the final stretch of floating of the river is dotted with huge boulders and narrow chutes, unlike many where the area just above the mouth becomes wide and slow. The gorge of this last distance features a twisty rapids known as Stem Winder and the boulder-filled Bow Dipper. 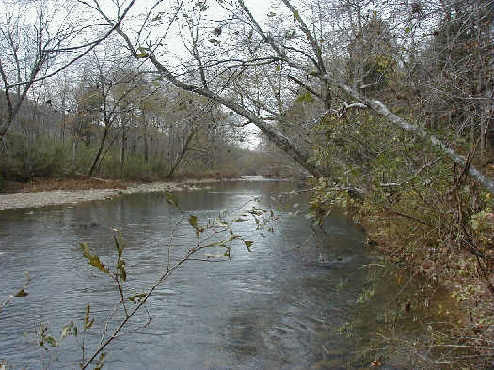 Reports on float conditions on the Mulberry River are hard to come by. There is only one recognized gauge and it's well down the river and is not easily read except from the river. Check river conditions before you start a float. Look for large amounts of debris, rising water, and adverse weather forecasts. The steepness of the drainage area can cause the Mulberry to rise fast, so be cautious if rain is expected. The mighty Mulberry is a river that deserves respect, but it's also a river that also deserves its reputation as the best float stream in the state.